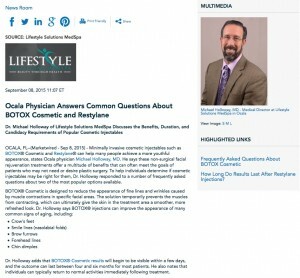 Dr. Michael Holloway of Lifestyle Solutions MedSpa discusses the benefits, duration, and candidacy requirements of popular cosmetic injectables. Ocala, FL — Minimally invasive cosmetic injectables such as BOTOX® Cosmetic and Restylane® can help many people achieve a more youthful appearance, states Ocala physician Michael Holloway, MD. He says these non-surgical facial rejuvenation treatments offer a multitude of benefits that can often meet the goals of patients who may not need or desire plastic surgery. To help individuals determine if cosmetic injectables may be right for them, Dr. Holloway responded to a number of frequently asked questions about two of the most popular options available. Dr. Holloway adds that BOTOX® Cosmetic results will begin to be visible within a few days, and the outcome can last between four and six months for most patients. He also notes that individuals can typically return to normal activities immediately following treatment. Restylane® shares many similarities with BOTOX® Cosmetic, Dr. Holloway explains; however, Restylane® is a dermal filler used to add volume to facial features and hydration to the skin, not to limit muscle contractions. While both can be effective at minimizing signs of age, Dr. Holloway says Restylane® can also be very useful for enhancing the contours of the lips and other facial areas. Furthermore, Dr. Holloway notes that Restylane® and BOTOX® injections can be performed together for more comprehensive aesthetic enhancement. He says the effects of Restylane® are often noticeable shortly after treatment, and the benefits can last up to a year for many patients. Dr. Holloway believes that BOTOX® Cosmetic and Restylane® can be excellent methods to achieve beautiful facial rejuvenation. He notes that they can provide rapid results, little to no downtime, and natural-looking effects when administered by a skilled injector. Dr. Holloway encourages patients considering cosmetic injectables to discuss their aesthetic goals with an experienced and attentive physician who makes them feel at ease. Dr. Holloway is the Medical Director of Lifestyle Solutions MedSpa and a bariatric physician. He completed his undergraduate education at the University of Florida, where he also earned his medical degree. He then completed additional medical training at Duke University. Dr. Holloway is a member of the American Society of Bariatric Physicians. He is available for interview upon request. For more information about Dr. Holloway and his practice, please visit lsmedspa.com and facebook.com/lsmedspa.